Proprietary Name: Leader Infants Pain And Fever What is the Proprietary Name? 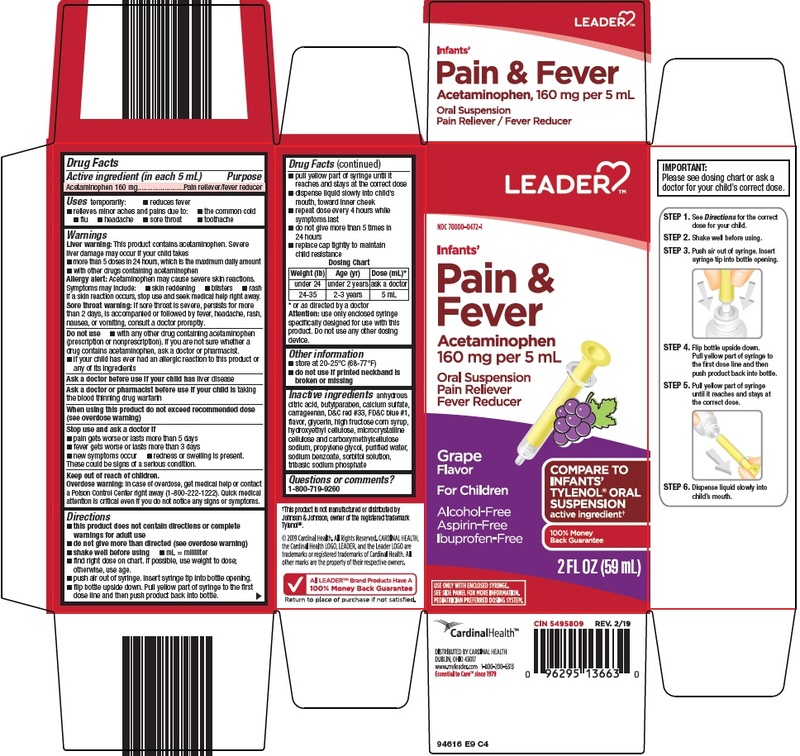 Leader Infants Pain And Fever with NDC 70000-0472 is a a human over the counter drug product labeled by Cardinal Health. The generic name of Leader Infants Pain And Fever is acetaminophen. The product's dosage form is suspension and is administered via oral form. •pain gets worse or lasts more than 5 days •fever gets worse or lasts more than 3 days •new symptoms occur •redness or swelling is present. These could be signs of a serious condition. •this product does not contain directions or complete warnings for adult use •do not give more than directed (see overdose warning) •shake well before using •mL = milliliter •find right dose on chart. If possible, use weight to dose; otherwise, use age. •push air out of syringe. Insert syringe tip into bottle opening. •flip bottle upside down. Pull yellow part of syringe to the first dose line and then push product back into bottle. •pull yellow part of syringe until it reaches and stays at the correct dose •dispense liquid slowly into child’s mouth, toward inner cheek •repeat dose every 4 hours while symptoms last •do not give more than 5 times in 24 hours •replace cap tightly to maintain child resistanceDosing ChartWeight (lb)Age (yr)Dose (mL)*under 24under 2 yearsask a doctor24-352-3 years5 mL* or as directed by a doctorAttention: use only enclosed syringe specifically designed for use with this product. Do not use any other dosing device.